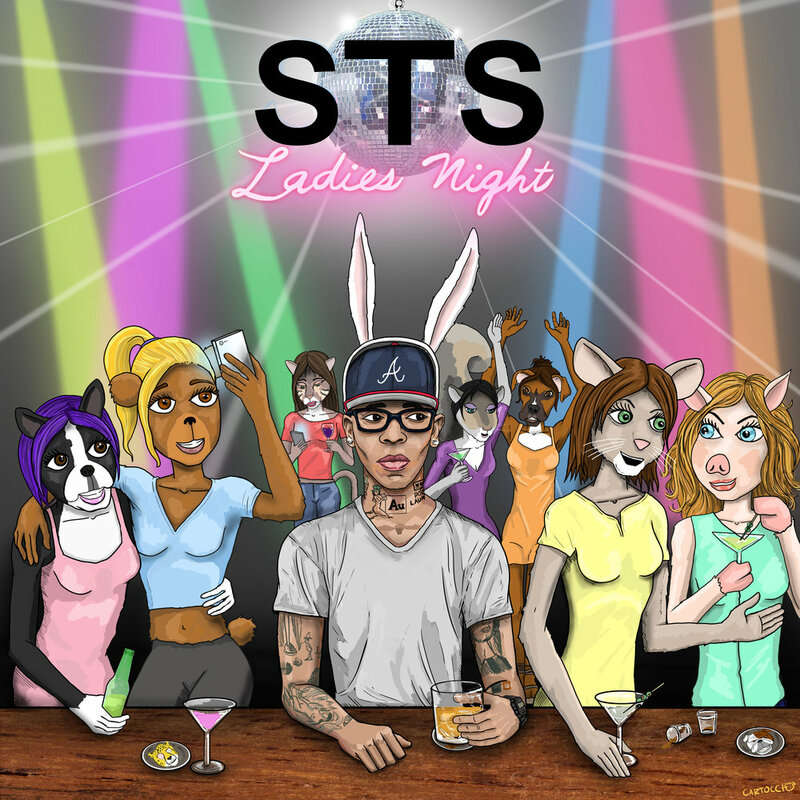 Atlanta-bred, Philly-based rapper STS, a/k/a Sugar Tongue Slim, got his name because of his talent for writing and poetry. In 2000, his love for poetry took him to the city of Philadelphia, known as a Mecca for poetry slams and he quickly established himself in the poetry scene. His writing got the attention of those around him and he was encouraged to take his talent to the music industry. In 2004 Slim co-wrote Ciara’s hit song "Oh". The song became Ciara's third top five single and remained on Billboard’s Hot 100 for twenty three weeks. Slim turned his attention to music full time. He was able to hone his skills as a rapper and worked with some of the Philly area’s finest producers including legendary DJ Jazzy Jeff as well as multi-platinum producers, Dre & Vidal. In the same year Slim teamed up with fellow rapper Corn Bread and the two would land a deal with Def Jam Records courtesy of Jay-Z and the Carter Administration. Shortly after signing the deal, an automobile accident left Slim seriously injured and unable to walk, or record. After his recovery, Slim once again focused on music full-time, now as a solo artist. In 2008, Slim released his Demand More mix-tape series. As a fan, Slim was vocal in his displeasure with the state of rap music and asked that people “demand more” from artists. “Artists got too lazy with the music. I felt we as fans and the paying public should demand more for our time, money and attention.” Selections off the mix tapes would find their way through out the blogosphere on sites such as IllRoots.com and 2DopeBoyz.com and onto the playlists of some of rap’s biggest tastemakers. In March 2010, Slim released Demand More II--backed by powerful production, the mixtape was laced by renowned beat smiths such as Sean C & LV (Jay-Z, The Clipse), Emile (Kid Cudi, Eminem) and Don Cannon (Young Jeezy, 50 Cent) and also featured appearances by Black Thought of The Roots, Cassidy and RL of the R&B group, Next. The project struck a chord with hip hop fans hungry for something new and fresh as it instantly became one of the most downloaded mix-tapes of 2010. In August 2011, Slim released The Illustrious. The project would end up on NPR's list of Top 50 favorite release of 2011 alongside Adele, Frank Ocean and Watch the Throne and in late 2011, NPR Music selected STS as one of their “Favorite New Artists Of 2011”.Recorded in Atlanta’s legendary Tree Sound Studios, The Illustrious was a culmination of years of mastering words, music and lifestyle. “Illustrious is the way I want people to feel when they hear my music. It’s how I feel. Every occasion, every location, every ensemble in my wardrobe, but more importantly my music is illustrious.” For the project, Slim gathered up some of hip-hop’s best to provide backdrops for him make his statements. They include SKI BEATZ (Jay-Z, Camp-Lo, Curren$y), ALCHEMIST (Nas, Linkin Park), WILL POWER (YelaWolf, Wiz Khalifa) and The Knux (B.O.B). Next came the GOLDRush--every week, someone associated with a Top 40 was flipped. Lady Gaga was getting flipped. Rick Ross was getting flipped. Big Sean was getting flipped. GOLDRush, was a weekly initiative from Slim featuring your favorite radio records getting the underground treatment. The release featured 15 “flipped” records, which covered previously released hits from Gotye (”Cut Me Off”), Britney Spears (”Out of Control”), Wale (”Great Mood”) and more. Joining STS on GOLDRush were ASAP Ferg, Dosage, Kardinal Offishall, Rog Rebel, and Schoolie V. Production came courtesy of The Starting Line Up, which included MPIII Music, DJ BearOne, Schoolie V, Eric Hahn Solo, Danny Gallardo, Ayden and Marz138.